Garlic roasted beet leaf chips with sea salt make a healthy and tasty snack that are worth making, especially if you love kale chips. Plus, they’re a great substitute for potato chips! When I recently visited a friend in Phoenix, she surprised me with a wonderful feast made with organic ingredients from her garden that made me feel like a royal guest. I had lucked out, not only because whatever she and her significant other cook is always fabulous and practically bordering on gourmet food, but because they were detoxing. So the focus was on fresh foods with lots of vegetables and no gluten, dairy, or red meats, which fit my diet plan perfectly. As I relaxed on her new patio watching the desert sun set, my husband and I sipped on refreshing cucumber spa water and enjoyed dipping cool cucumber slices into the baba ganoush, a Middle Eastern dish made with roasted egg plants that’s similar to hummus, but even better. She then asked if we liked kale chips. Bring ’em on we said. We were shocked and delighted to see her bring out a plate of kale chips stacked — no kidding — about 6 inches high! They were the biggest kale chips we’ve ever seen and definitely the best we’ve ever had. What I really liked about them is that she didn’t break up or cut the leaves as most recipes suggest you do. Also, she didn’t just toss them in oil. Instead, she kept them whole and said she wiped each leaf with garlic oil. Enjoy crispy roasted garlic beet leaves as a great snack or appetizer. As we feasted on the crisp, crunchy chips, I learned she had used some beet leaves as well. Knowing that I had beets back home growing in my garden, I was convinced that when they were ready to harvest that I must try to make some beet leaf chips as well! Hers were fantastic, so if I could make something half as good, I’d be happy. Well, today was harvest time! Much to my surprise, my beets managed to grow so fast even though I planted them just over a month ago. So I pulled most of them up realizing I had to do something with them. I’ll probably make some beets for a side dish and use the rest for juicing. In terms of figuring out what to do with the leaves, that part was easy. Beet leaf chips were a no brainer. I made ’em and they were delish! But before we get into how to prepare them, which is so easy by the way, let’s talk a little bit about the nutritional aspects. A beet ready to harvest. A beautiful assortment of colorful beets straight from the garden. 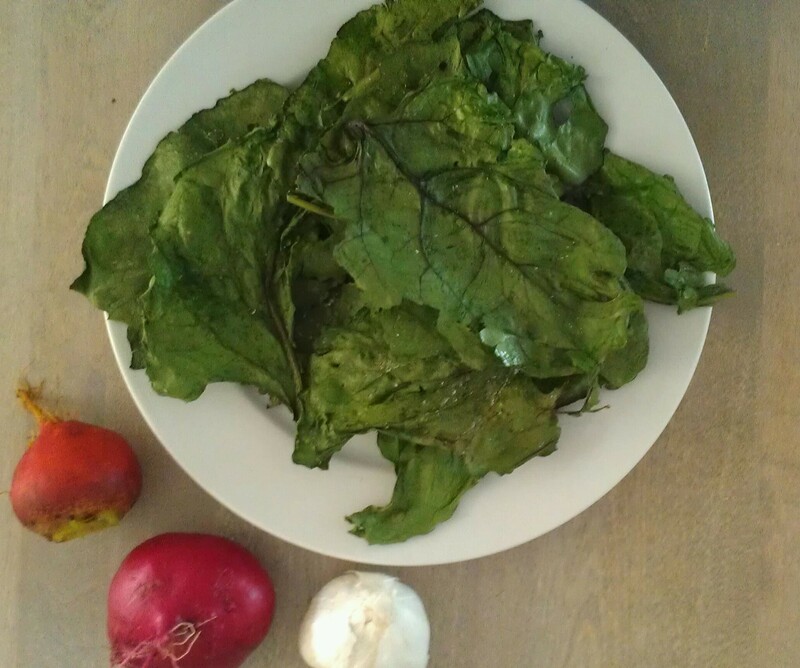 Turns out that beet greens have some amazing nutritional benefits. According to The World’s Healthiest Foods, they are a great source of iron and provide a pretty decent ratio of magnesium and calcium compared to other greens. In addition they are full of folate. They also contain eye-health supporting nutrients like the carotenoids lutein and beta-carotene. In addition, they are chock full of Vitamin K, which helps with blood clotting. And they even contain protein. That’s all the good stuff. Is there anything bad? Yes and no. Beet leaves are naturally high in salt. One cup of 1″ pieces has about 347 mg of sodium, which is about 14% of the DV according to this fact page by Self Nutrition Data. Also, the World’s Healthiest Foods points out that beet greens contain about 10 times as many oxalates as the roots. For most people oxalates aren’t a problem, but if you’re on a low-oxalate diet or have a history of kidney stones, then you might want to steer clear of beet greens. However, in this Healthline.net article, “What Is a Low-Oxalate Diet?,” it is suggested that eating calcium-rich foods along with foods high in oxalates (e.g., beet greens, purple grapes, quinoa, chocolate, almonds, bran flakes, tea) may be a better strategy to help lower your risk of kidney stones. So, maybe with the beet leaf chips, enjoy some cheese! But even if you don’t eat dairy with them, remember they do have calcium in them. So I can’t help but wonder if that would counteract the oxalate content to a certain extent? 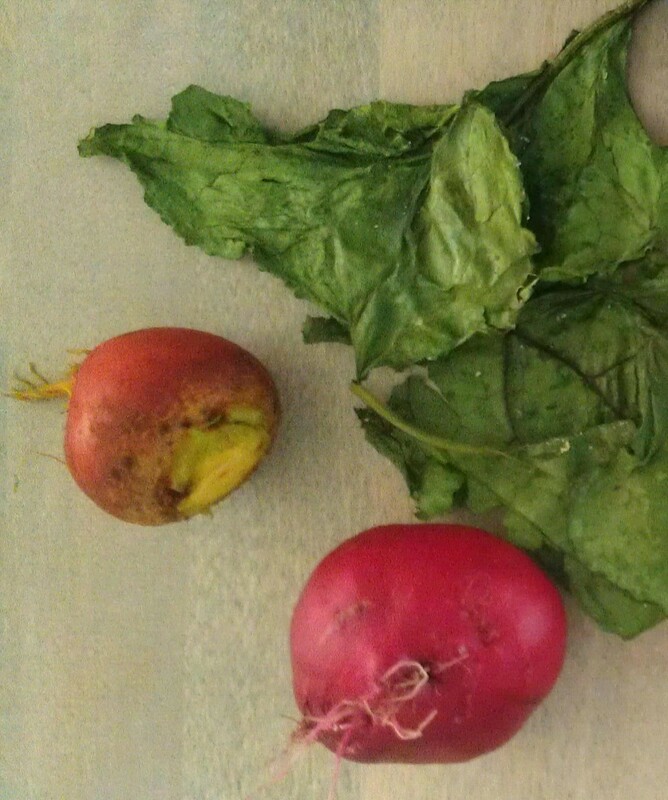 Maybe Mother Nature took care of the “oxalate problem” when it came to beet greens! By the way, although oxalates aren’t a required human nutrient, I did find it fascinating to learn from the Healthline article that oxalates may serve as a gut prebiotic. In other words, they help may help balance your digestive system by supporting good gut bacteria. 1. Wash the beet leaves. Whether you’re harvesting your own or using leaves from store-bought beets, washing them is essential, of course. Otherwise, you might be chomping on some dirt — or worse — a few critters. Not sure about the best way to wash the leaves? Then check out my post, “Which of These Ten Methods is the Best Way to Wash Your Produce?” You may be surprised to find out which method is actually the best, by the way. I know I was after I did the research. 2. 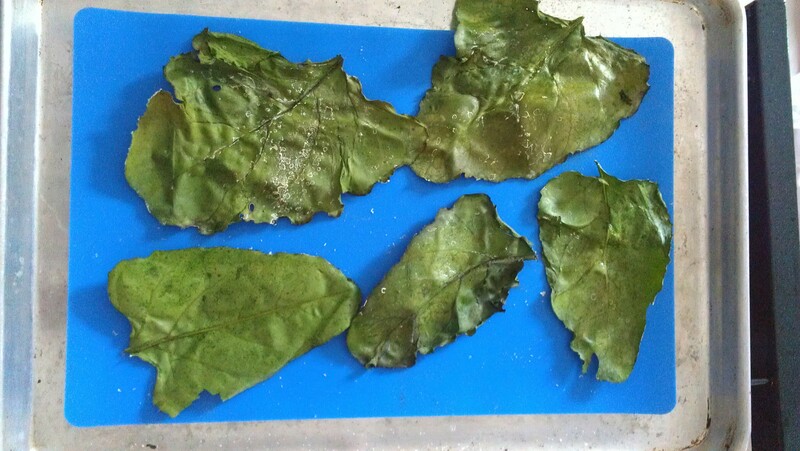 Dry the beet leaves. Place them in a colander or in a salad spinner if you have a large enough one. Or, pat the leaves with a clean dish towel to dry them, which goes quicker than you think. As I was in a hurry, I did a combo. I dried them in a colander for a little while and then I used a towel, since I didn’t have time to wait. Also, I wasn’t too concerned about whether they were bone dry or not, because as you’ll see in Step #5, I took care of that problem when I applied the oil. 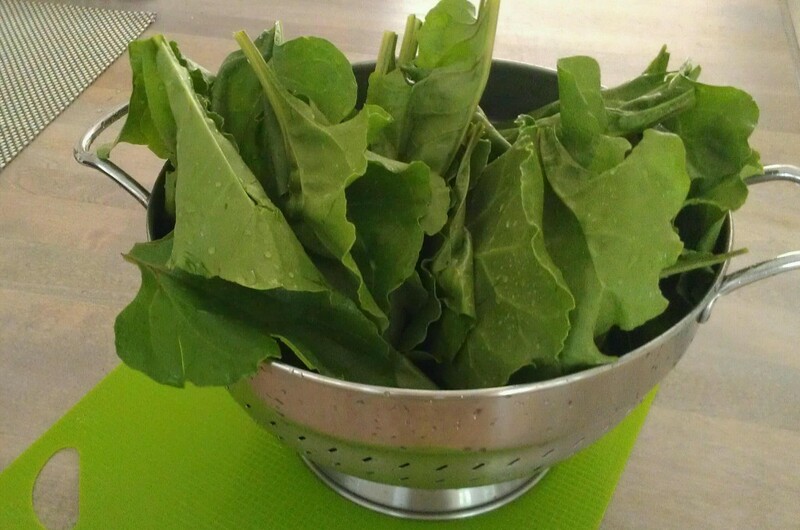 Save time by washing the beet leaves and letting them air dry in a colander a few hours ahead of time. I read a few recipes online about how to make kale leaves and saw people suggesting temps ranging from 275° to 350°. So, I decided to use a figure right in the middle — 325. It worked well, but if you know your oven runs hot, maybe 275 or 300 would work better for you. Oh, and if you have a convection setting, definitely use that. It will evenly cook the leaves better. 4. Cut the beet leaves. 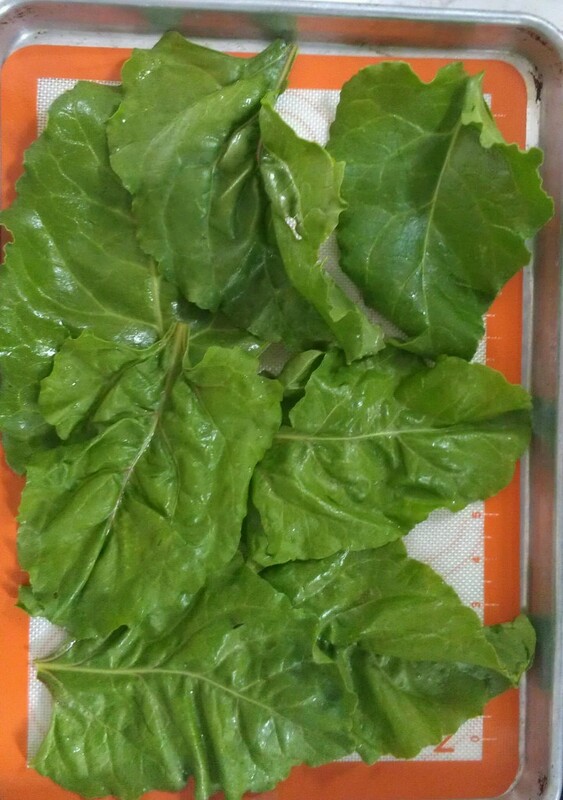 The stems aren’t too tasty, so stack several leaves together at once to save time when cutting them. 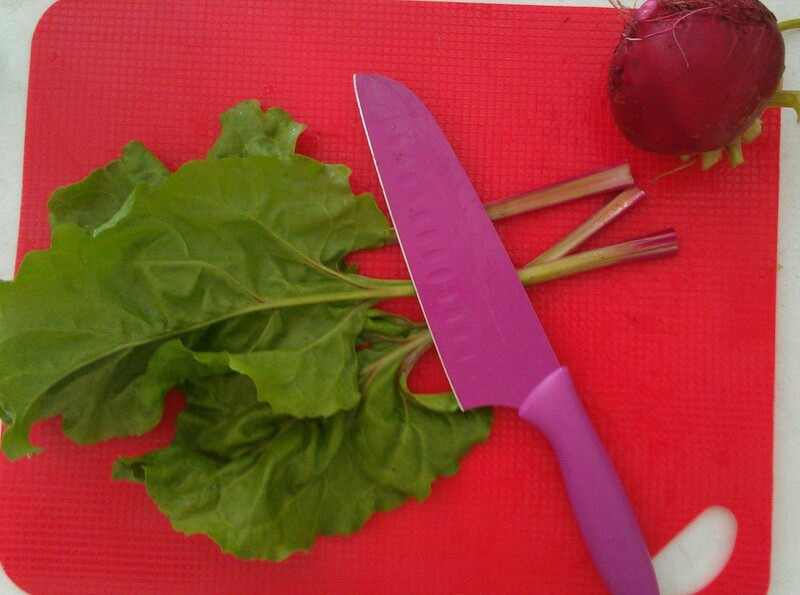 Cut off the tough stems when preparing the beet leaves. 5. Coat the leaves with garlic oil. I used a paper towel for this job, but you could use a napkin as well. As I had some garlic olive oil handy, I poured a little into a bowl and dipped a folded paper towel into it. I then wiped the napkin over each leaf — front and back — to ensure I wasn’t getting too much oil on each leaf. It also helped sop up any left-over water droplets from leaves that didn’t dry that well. This method worked really well and it went really quickly believe it or not. It wasn’t messy and I used only about 2 teaspoons of oil max for about six baking sheets full of beet leaves. Note: You can also make your own garlic oil by following this Ina Garten recipe from the Food Network, which takes only about 5 minutes. 6. 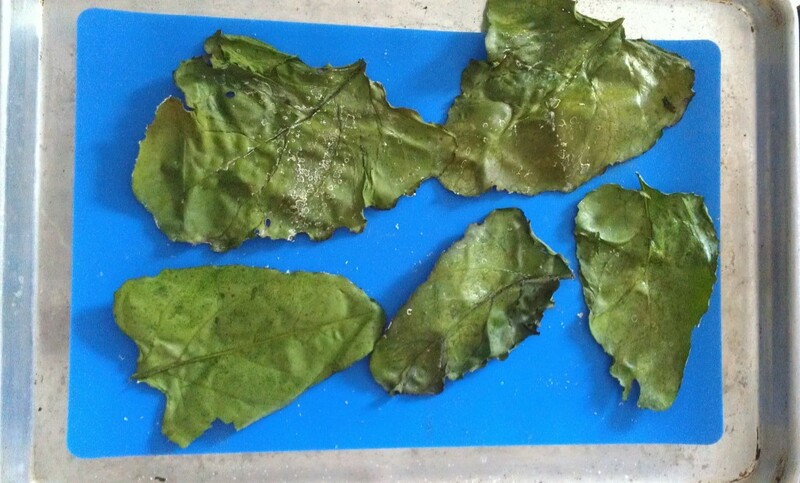 Place the leaves on a cookie sheet and season them. On a cookie sheet lined with parchment paper — or if you have one, a silicone baking mat –arrange the beet leaves so they don’t overlap. If you do overlap them a little, you will have to move them mid-way through baking. Otherwise, they will not crisp evenly and parts of them may be a little soggy, which is something you don’t want, of course. Lightly sprinkle on some sea salt (as I noted in the nutrition section above they already naturally contain sodium, so no need to overdo it) and freshly cracked pepper if you wish. Note: Other spices that might taste good would be cayenne pepper or perhaps some Italian spices. Adding in a little grated cheese like parmesan would be tasty, too. If you try any variations, please let me know how they turn out by leaving a comment. The way not to arrange the beet leaves I quickly learned. Leave a little space between them. 7. Bake for 20 – 35 minutes. As you can see, I’ve got a range of time here. Depending on how big the leaves are and how well your oven works, the cooking time will probably vary. I found that after about 20 minutes, I felt I needed to check mine about every 5 minutes or so to gauge if they were done or not. I realized that once I could easily grab a leaf and lift it up off the baking sheet without it bending (it was stiff like craft paper), they were done. If you see any parts sagging, just put them back in for a few minutes. I cooked mine for probably about half an hour. This is how the roasted beet leaf chips look when they are done — nice and crispy. After I got done making a few batches, I had my daughter and her friend try them. Since she’s absolutely crazy about kale chips, I figured she might like beet leaf chips, too. They said they were pretty good. So, there you go, “teenager approved.” I thought they were yummy, too, and so did the hubby. How about you? Do you think you’d like to try some beet leaf chips? 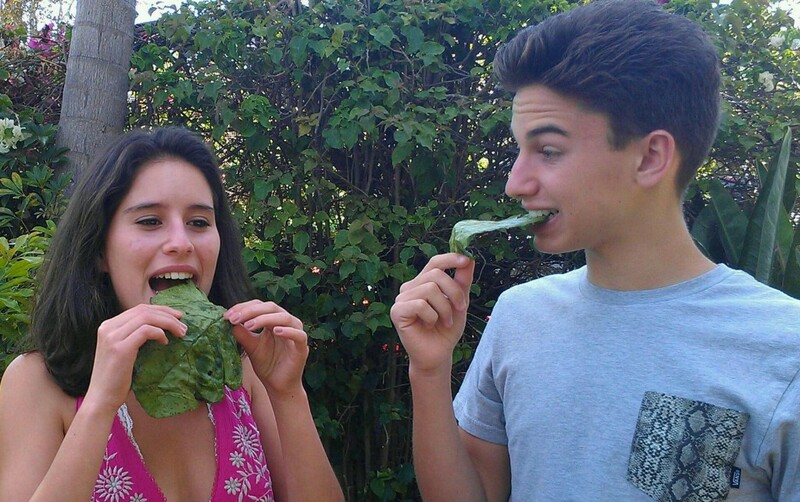 My daughter and her friend trying some beet leaf chips for the first time. 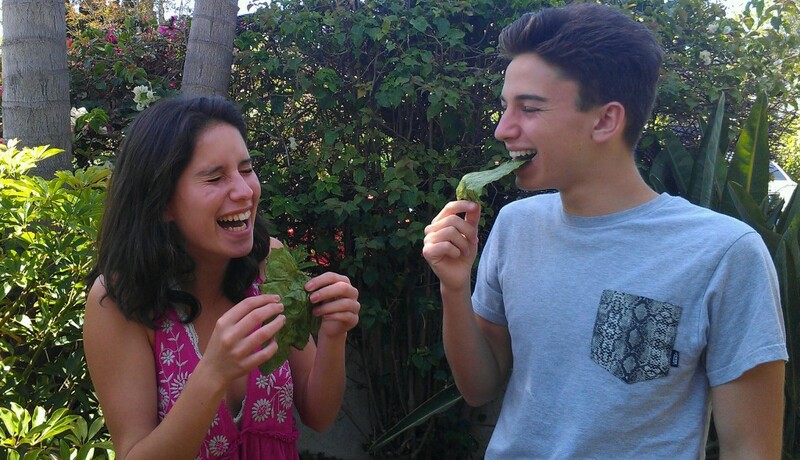 Having fun while trying the beet leaf chips! By the way, these are meant to be enjoyed fresh. After storing some in a gallon-size zip lock bag, they lost their crispiness. Hmmm. Maybe a paper bag would have worked better? Anyhow, give them a try. They’re a great way to use beet leaves and make a fun appetizer or snack that’s sure to satisfy savory cravings. Guaranteed. I usually buy the beets that already have the greens removed. I think I need to change that, beet chips sound so good. I’ve not ever heard of this snack but it sounds intriguing. I’m going to have to give them a try and force feed them to my kids. They’re fun to make and yeah, you may have to “convince” the kids to give them a try! I’d like to know more about the virtues of sea salt. I hear great things about it (primarily it’s better than table salt), but why? What’s so good about it? Well this is certainly different Karen! I must admit I saw the words “Roasted Beef” before I realized you referencing chips!LOL! But I’m glad I decided to read your post anyway. you’ve probably go a winner!LOL! And it seems simple enough to at least try i a couple of times!Thanks! This sounds like a great idea! 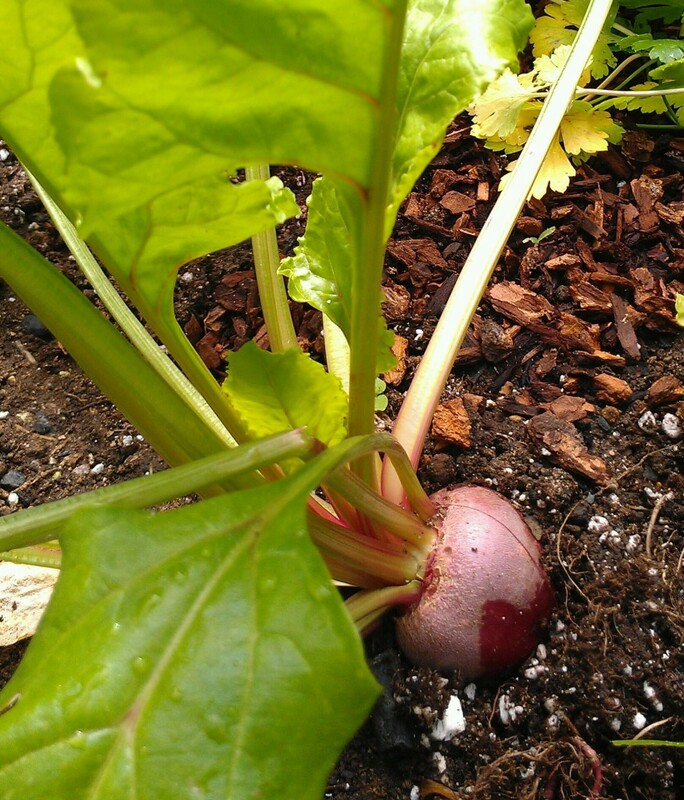 We always grow beets, and steamed beet greens do get tiresome when we cook them all the time. I wonder how long my oven would be on, if I made enough for my whole family?? If all my kids are home, that’s 8 people! I guess it depends on how many they want to eat! I made about 18 – 24 of them at a time as I could fit one cookie sheet on each of the three racks of my oven and each sheet fit 6 – 8 large beet leaves. I am excited to tell you I just made some kale and beet chips tonight. I coated some with coconut oil and others with basil olive oil. They tasted delicious and that makes it so easy to eat my kale. Usually I would just throw out the beet leaves. In fact, I usually just buy lone beets with the leaves already removed. I’m so glad to hear that you gave it a try! I love the idea of using coconut or basil olive oil. I imagine the coconut oil must have countered the slightly bitter and salty taste in the beet leaves? And basil would definitely be a really nice complement. Now you’ve inspired me! The next time I whip up a batch of beet or kale leaf chips, I’m going to try some coconut and basil olive oil as I happen to have both ingredients on hand. Thanks for sharing your experience. Always appreciated! I always buy beetroot to roast in the skins, like jacket spuds! sometimes i peel raw and grate them with a little cidre or wine vinigar as a salad topping…I love them but they usually have the leaves chopped of on route to the shop, sadly. However i do grow a few myself and always eat baby thinnings of leaves raw as a salad dressing. and yes if get any I will new try roasting the leaves as you describe. fab. Grating beets on salad and tossing them with a little wine or apple cider vinegar really does sound tasty! And they would really be pretty by adding in a little color. I’ll have to try that as I need to get more creative considering I’m growing a bunch of them in my garden. Also, I like the fact that you harvest the young leaves to toss in your salad. Have you noticed if the taste of the leaves changes significantly depending on their age? I imagine the young ones might not be as bitter. 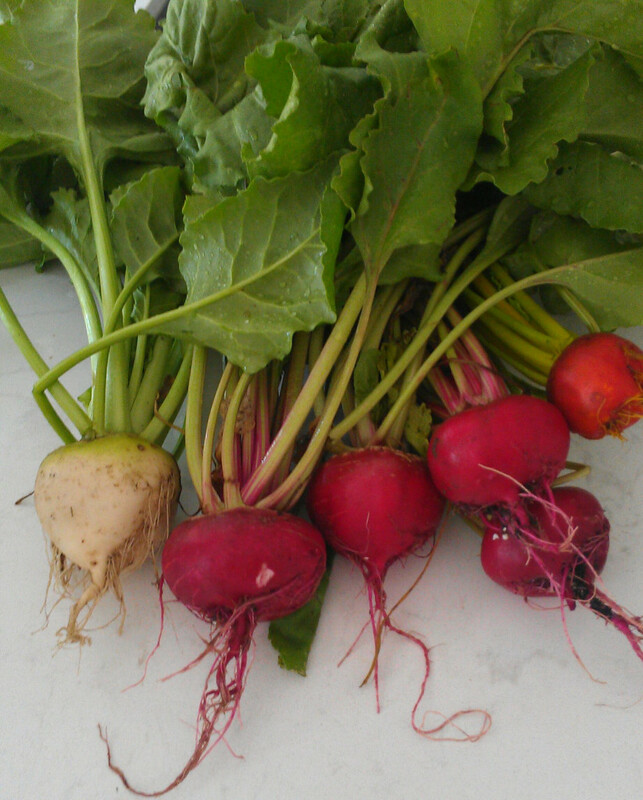 Thanks for sharing how you eat beets and beet greens. Glad to hear you might give roasting them a try, too! I usually throw away the beet leaves, so this will be something new to try. Your images and descriptions make it all seem so simple, so healthy and also so appealing. When it comes to beet greens, I used to toss them into the compost. Then started cooking them with the beets. What I love about beet greens that I just learned here is that it has a good balance of calcium and magnesium. Both of which is needed for my tired old bones lol. This is amazing…I made Kale chips before but sing the beet greens especially with garlic is something I will do. I love the way you showed us the step by step process. The pictures are fantastic. I love coming to your blog to learn the nutritional information you share along with the recipe. Keep them coming girl. You are making me healthy each and every week! I like your idea of cooking the beet greens with the beets for another great way to use them. How do you do it? I’ve never cooked them together, but I have sautéed beet greens by themselves with a little olive oil, garlic, and sea salt. Always tasty.